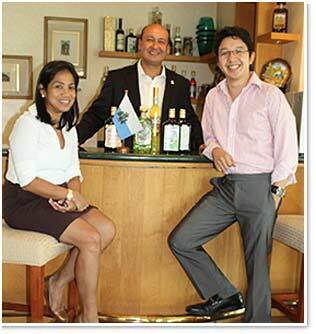 Spearheaded by the Consul General, Mr. Jean Henri D. Lhuillier, together with the creative genius of Ms. Margarita Fores and hosted by Mr. RJ Ledesma, the Consulate General of The Republic of San Marino held a Liquor Launch for members of the media last August 20, 2008. The Consulate office was transformed into a chic lunch bistro that was made to entertain and dazzle the senses. Aside from giving her interpretation of local Sammarinese dishes, Ms. Fores came up with a special lunch menu infused with the different liquors from San Marino, such as the Assenzio, Amaretto di San Marino and Limoncin. Starting from the appetizers until dessert, every taste bud was tickled by the sumptuous dishes that were served, giving delight to the friends from the media in a very San Marino way.